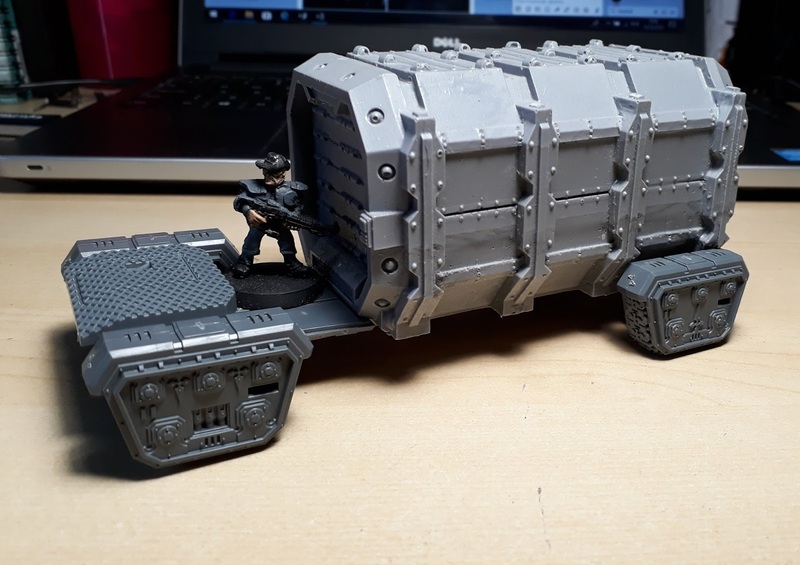 Over the next three weeks of my gaming group's current Necromunda campaign, we're going to be playing a scenario involving the looting of a Guilder caravan. 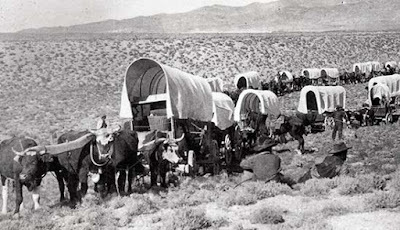 We've said that players can represent the caravan with a suitable vehicle, train of animals, or even a large counter, but I figured I'd like to actually have a specific model. I started rummaging through my bits and pieces and found a large scifi container given to me by a friend. The size and shape immediately evoked Old West 'Prairie Schooner' wagons. 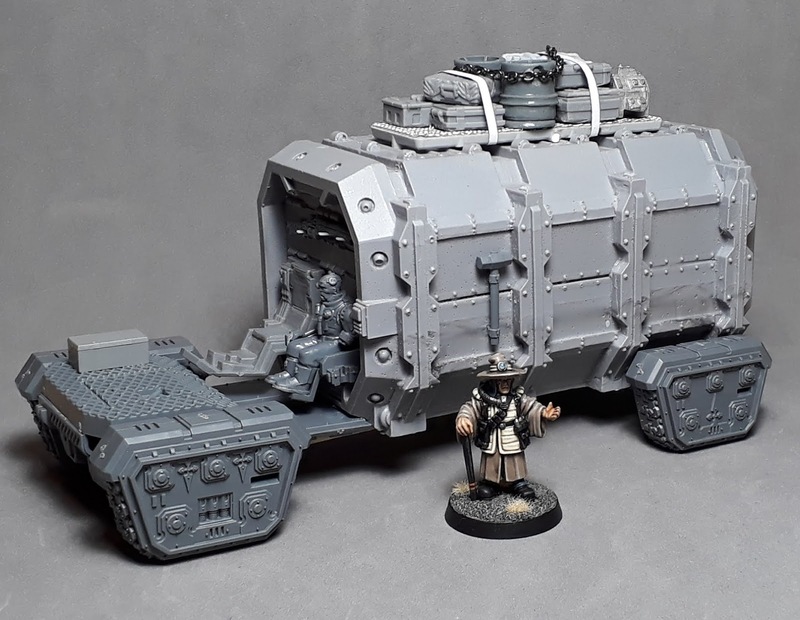 The tracks are from the Astra Militarum Taurox Prime. As is the floor for the cab. The raised section between the front tracks is the inner rear door from an Astra Militarum Chimera. The driver is a composite of Taurox crew and plastic servitor bits. Finally the stowage was made from an old empty plastic sprue, overlain with car mesh and filled with a variety of drums, boxes and cannisters. The chain is a chain, and the strapping is just paper. Every travelling salesperson needs a suitable method of transport. The armoured Mk IV 'Wastes Schooner' is a rugged and functional, if not the most elegant option on the market. I kept the paint job relatively quick and simple. The container had to be white in order to evoke the Prairie Schooners. The track units ended up being a utilitarian grey, livened up by some hazard markings and the weathering. Everything got hit with some washes, chipping and a heavy drybrush of a light brown, and the job was done! It's not too big a statement to say that the resulting wagon is one of my favourite scratchbuilds - something about it just pleases me greatly. I can't wait to have it ambushed by mutie riders or whooping Eschers with warpaint and feathers in their hair. I just wish I had another half dozen so I could put them in a defensive circle! "We don't like travelling salesfolk around these parts! Now git!" This is probably mt favourite of your builds Axiom. Apart from the vehicle itself which is full of fab detail and looks like it came out of a box as a kit in it's own right, it's so incredibly useful to have a vehicle like this. It's exactly the kind of thing I've been daydreaming about for my cult wagons. The painting on the container on particular is fab. Care we walk me though the white recipe? This one is all win. Looking forward to in-game shots. Your cult are welcome to borrow it any time! There are definitely some rough areas, but they're hidden for the most part. I do fancy making a removable passenger to pop into that empty seat. 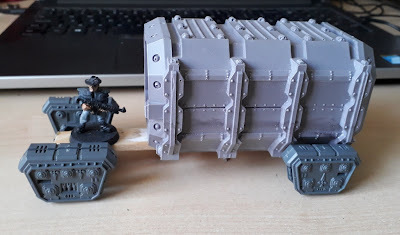 I reckon you could make a similar thing from the GW Munitorum containers? The container is pallid wych flesh roughly painted over a grey undercoat. I washed the whole thing with thinned agrax earthshade, then drybrushed it with pallid wych flesh. Some sponge weathering with a dark grey, then washes and that's it! Cheers Axiom. It looks brilliant, very Nostromo. Well that's way better than any repurposed existing vehicle for sure ! This model is brilliant because it's immediately recognisable despite being unique. I did have a truck I could have used, but sometimes it's fun to play around with stuff. Really pleased it evokes the original source material. Great idea, and should be useful in all manner of games! It's going to see a lot of use I suspect - even as scenery it's a nice addition to the table. Wagons Ho!!!!! Very cool Jon. It almost needs a kid or women mutant peering out the back. Great idea Jon, and excellent execution - that’s some proper frontiering kit right there! Absolutely love this! So many nice touches that reinforce the concept, like the rifle mounted above the seats. Really pleased you like it, even more pleased somebody noticed the rifle (for tackling bands of thieving bandits)! Hey, this is great, particularly how it evokes that prairie schooner look without actually being a wagon as such. The open area at the front to put a based character on is a nice touch too. Thanks! The shape and banding really helps with the prairie schooner look I think.